1. Sewage sludge proceeds to the first feed hopper and to the conveyor belt of the composting section. Sawdust proceeds to the second feed hopper as well as the conveyor belt of the composting section. The optimal humidity level should not exceed 60% for the process of fermentation. For this reason, it is necessary to put sawdust or other organic water absorbing material into sewage sludge to decrease the humidity level. 2. 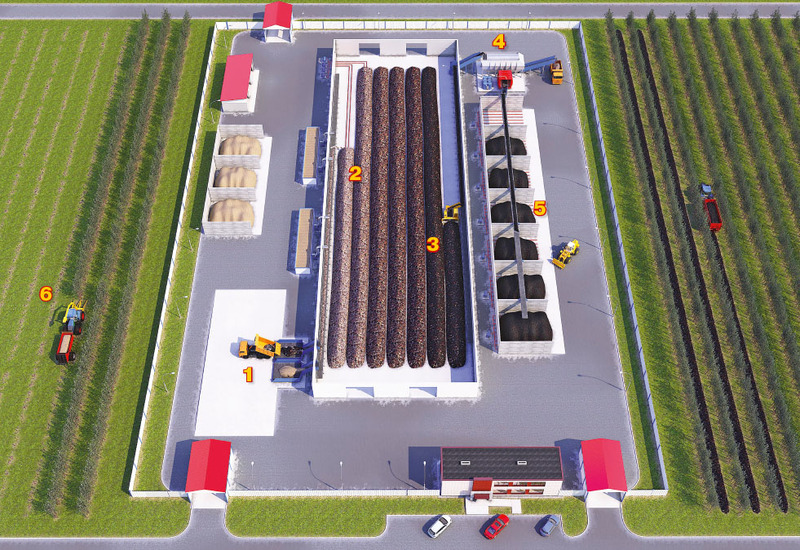 The moldboard moves towards the conveyor belt and forms the first composting heap. 3. Komposter agitation vehicle turns the heap and applies thermophilic lactic bacteria. Microorganisms feed on the organic waste, reproduce and produce organic compound and energy. During composting the heap is heated up to + 70ºC and pathogenic population of bacteria, worm eggs and fly larvae are destroyed. Thus, mesophilic microorganisms naturally die and thermophilic microorganisms preserve their activity which speeds up the process of composting. The composting heap is additionally turned and displaced every three days to nourish the composting mass with oxygen and actively evaporate the excess humidity. Thus, compost is displaced seven times from dirty zone to the clean one and becomes neutralized in 21 days during the process of composting. 4. Komposter agitation vehicle moves the last heap to the conveyor belt. Along the conveyor belt, the heap then proceeds to the drum separator that separates small debris and not burnt out sawdust. 5. After separation clean compost is additionally decontaminated by ultraviolet and proceeds to the storage hopper. Resulting good-quality technical compost is a homogeneous dark-brown granular mass of “clean” category soil. GOST R 17,4,3,07 – 2001 Soils. Requirements for the Properties of Sewage Sludge when Used as Fertilizer. After state registration compost may be used for city planting, road filling, and sites for solid household waste. 5. Large amounts of sewage sludge result in the costly procedure of sawdust purchasing and delivery daily. It is suggested to grow brittle willow to resolve this problem. The chips collected when growing brittle willow may be used as a water absorbing material for composting of sewage sludge. Prepared compost may be applied as fertilizer, to fields for growing brittle willow (circulation of production and sewage sludge disposal). The recommended volume of compost to grow brittle willow amounts from 200 to 400 t/ha. We offer services for implementation of technology of industrial sewage sludge composting and invest in projects on concessionary agreement to accomplish sewage sludge decontamination and disposal task.